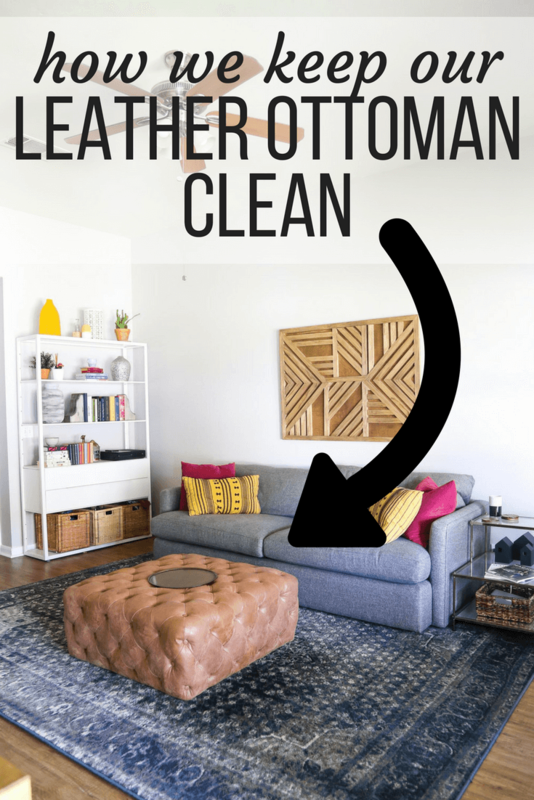 We get tons of questions about how we keep our gorgeous leather ottoman clean – so in this post I’m going to chat about how to clean leather using Mohawk Leather Conditioner! This post is sponsored by Mohawk Consumer Products and contains affiliate links, but all opinions are 100% mine. Thanks for supporting the brands that support Love & Renovations! 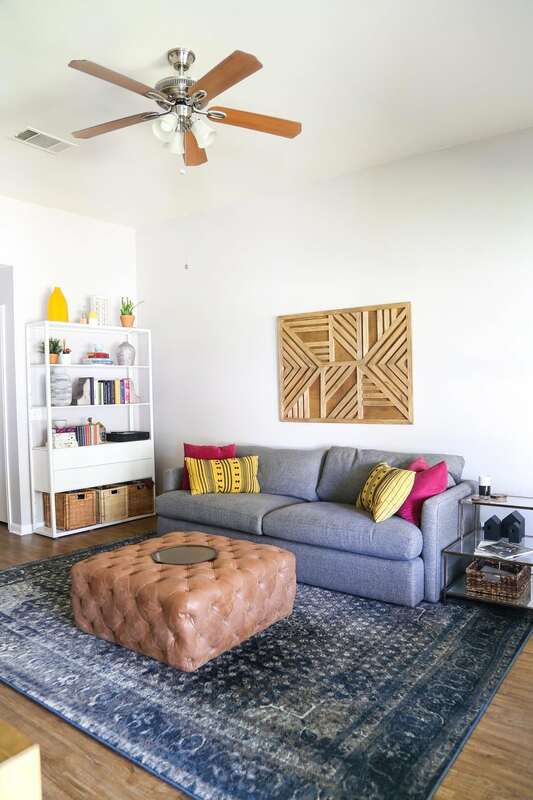 If you’ve ever seen a photograph of our living room, then you probably know that we have a large, glorious tufted leather ottoman right in the middle of it. This ottoman is, hands down, the number one thing in our home that we get asked about. Almost every single time I share a photo of our living room on Instagram, I get at least one question about it, and it’s basically the most widely adored thing we own. I mean, I get it. It’s pretty amazing. 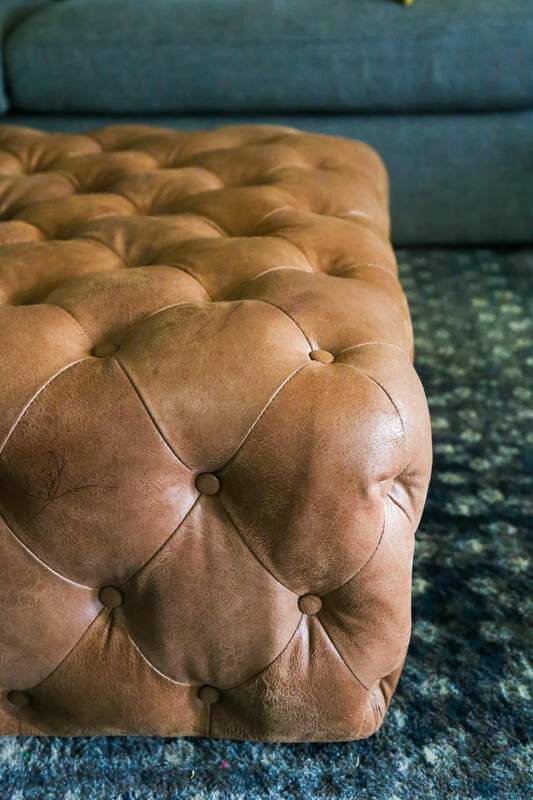 As much as I love this gorgeous ottoman, though, one thing I didn’t really take into consideration when we purchased it is how tricky leather can be to keep clean! It looks beautiful once it starts to get worn in a bit, but actual dirt or stains are incredibly hard to deal with. We learned that the hard way when we discovered a few pen marks on our ottoman (it literally looks like my child tried to draw a mural on one side of the ottoman) and couldn’t get them up no matter how hard we tried. Part of the problem is that many leather cleaners only work with certain kinds of leather. You can’t just use whatever to get your leather clean and expect it to work – you have to test any leather cleaner on a small, inconspicuous area because (as we’ve learned the hard way), some leather cleaners or other at-home remedies just won’t play well with your specific leather piece. 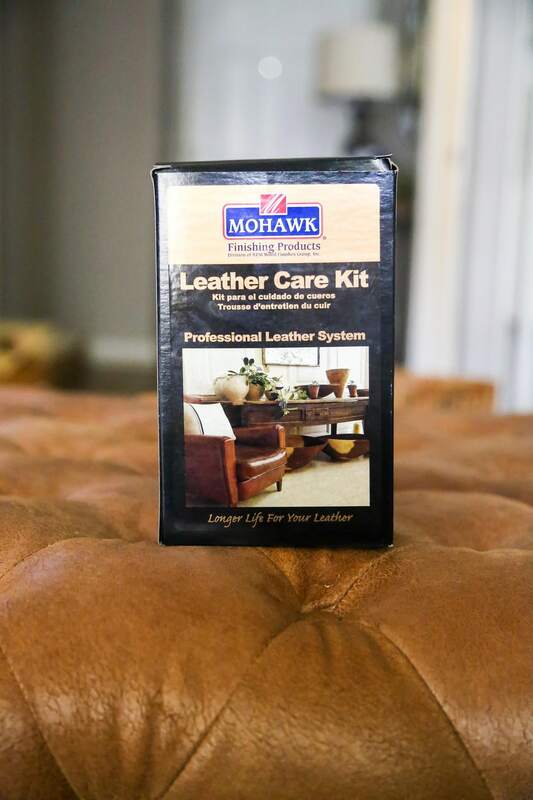 So, when Mohawk asked if I’d be interested in trying out their Leather Care Kit on our ottoman to get it looking fresh again, I was cautiously optimistic. I loved the idea of having a set of leather cleaner that would help me keep our ottoman looking nice all the time, but I was a little worried it might not work with our ottoman (since it’s a very particular kind of leather). Before I dove into anything, I tested all three of the leather cleaners that come in the kit on a small corner of the ottoman – the kit includes the Leather Cleaner, Leather Protector, and Ink Remover. Both the cleaner and the protector worked just fine but, just my luck, the ink remover didn’t play well with our leather. Judging by how well the other two cleaners worked on our ottoman, I’m confident the ink remover would be great on a different type of leather, but apparently our ottoman just wants to stay nice and inked up. And, really, we live in a house with one (soon to be two) young kiddos. Things are gonna get dirty – it’s just the way of life. I might cringe a little when I notice the pen marks on our ottoman, but they really aren’t all that noticeable unless you’re paying attention, and in the grand scheme of things it’s just not that big of a deal. But! The Leather Care Kit! Let’s talk about that because I was blown away by how big of a difference it made. I’ve tried a few things over the years to keep this ottoman clean, but I’ve largely left it alone – I’m always afraid to mess up the leather, and it didn’t really look all that dirty to me. But, once I got to work I quickly realized how badly our poor ottoman needed a good cleaning. I would compare it to super dry and scaly skin that’s desperately in need of lotion – it’s hard to tell just how dry your skin looks until you add some super moisturizing lotion and suddenly it’s all shiny and beautiful again. 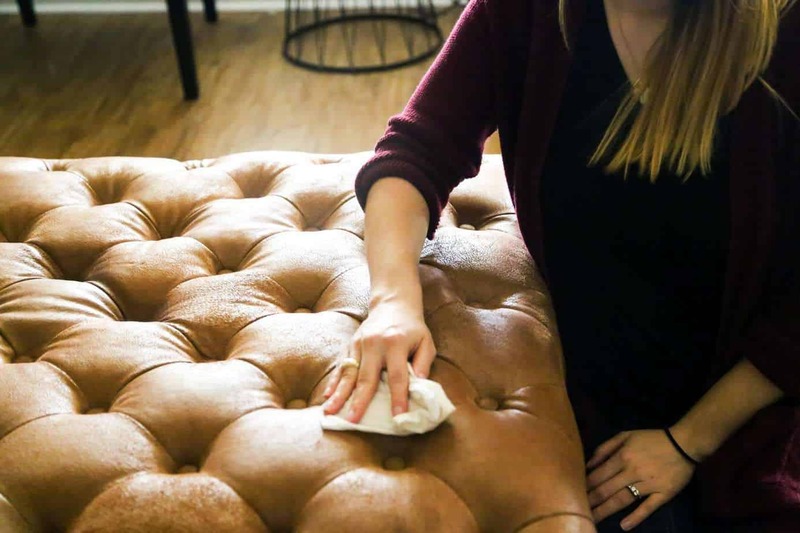 The ottoman looked okay, but once I started cleaning it with the leather cleaner, it was like it was brand new again – the color was richer, the leather was softer, and all of the little dirt marks that I never really noticed before were completely gone. If you scroll back up to the photo of the entire living room that was taken a few weeks ago, you can see how dry the leather really looked. And now? Please ignore the pen marks. It’s kind of hard to really see the difference in photos or video – but in person, it’s incredibly obvious. The colors are richer and deeper and the leather even feels a little softer! I made this fun little video to show you exactly how I used the supplies in the kit to clean my leather ottoman – and how easy it is. It just took me a few minutes for each step and, honestly, the hardest part of the whole process was keeping Jackson off the ottoman while it was drying. Check out the video below to see all of the details on my new process for cleaning my ottoman with Mohawk’s Leather Care Kit! I think my favorite part about the Leather Care Kit is that it comes with a leather protector that will help keep everything nice and clean. It also comes with the cleaning tools you’ll need to use it (a sponge and a lint-free cloth), which is great for me because I can never find that sort of thing when I need it. The bottle recommends that you use the cleaner and protector about once a month or so for pieces that see a lot of traffic, so I’m definitely going to be keeping up this routine to keep our ottoman looking fantastic all the time. Especially since my four-year-old is constantly climbing all over it – this baby sees a lot of action. Now if only I could figure out a way to keep my floors this clean all the time. 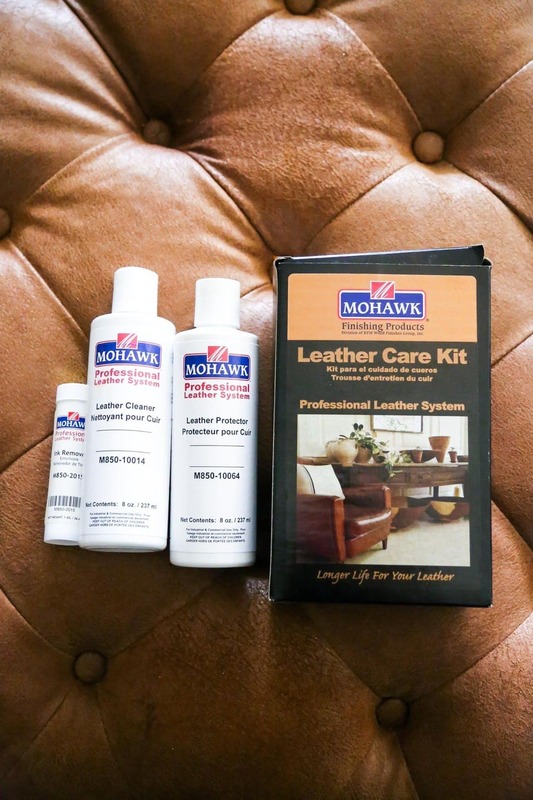 Be sure to check out the video for the full step-by-step on how I keep our ottoman clean, and don’t forget to check out Mohawk’s leather care line if you’re looking for a simple way to keep your leather furniture clean (you can buy it on Amazon, too! ).